What have your life’s peak experiences taught you about when you are at your best? What have been your recurring talents and callings, and how might these past lessons shape your future direction? It might take several hours to complete the exercise below, but if you are hoping to learn more about yourself and what you might be best suited to do in the future, begin by looking backwards. I ask each of my career transition clients to do this exercise. They sometimes protest that it took too much time, then afterwards smile with the satisfaction of knowing themselves much better as a result. Here is the assignment. 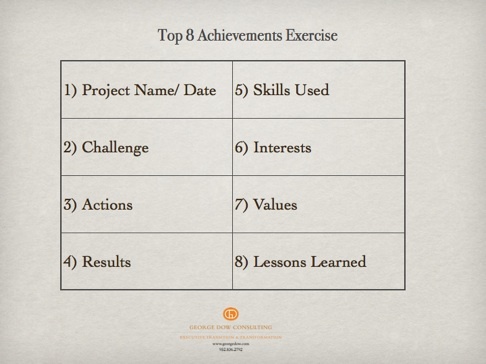 Take a look back at your top eight work and life achievements. Name each, then create a spreadsheet that includes the items below for each of these achievements. What do you see? What are the recurring themes? What skills, interests and values do you hope to connect to the future needs of the market and/or community? Aristotle once wrote, “Our calling is the intersection of our talents and the needs of the world.” What are you called to do now? How can your historical achievements and talents inform your future? It’s time to look ahead by first looking back.